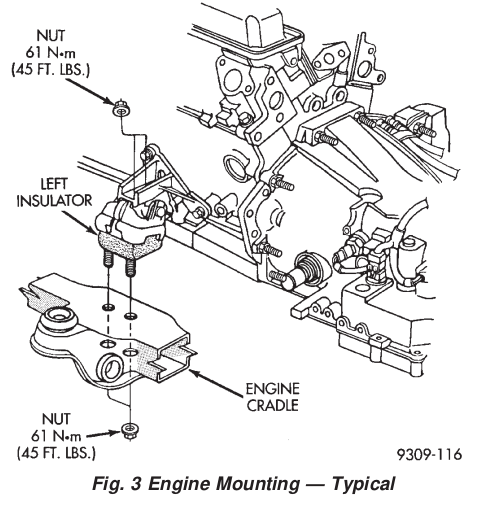 After troubleshooting rattle & vibrations; symptoms point to motor and transaxle mounts. 220,000 miles and hoping for many more. Love the car. I'm 70 years old and have always been able to resolve most mechanical issues on tractors, cars and trucks. Has anyone replaced either of these? I've located the engine mounts and removed the heat shields. It appears I will have to raise the engine several inches to clear bolts from engine and frame. Is it safe to place wood block on oil pan and slowly raise engine? Hmmmm. Sorry if this is a repetitive post...I searched for archival posts with zero results. I, humbly, thank you all for any support you can offer. FSM says to use a block of wood width-wise but I'd be nervous about that. I'd angle the wood to cover as much of the pan surface as possible. Changing the oil pan is a PITA. (2) Raise vehicle on hoist. wood across the full width of the oil pan. tom of the insulator to the frame (Fig. 2). move the insulator from it’s mount. (1) Install insulator onto the frame. (Fig. 2). Remove jack from vehicle. to mount and tighten to 61 NIm (45 ft. lbs.). (3) Remove the insulator thru bolt from the mount. fer to for bolt tightening specifications. Last edited by codyj; 01-08-2019 at 10:34 PM. Don't go solid rubber. Get the Hydraulic type. Last edited by Ronbo; 01-09-2019 at 01:25 AM. Dan/Daytrepper is a very knowledgeable and experienced mechanic. I would trust his advice on anything car related. PDF format. It's where the above diagram came from. Just print out whatever pages on your repair if needed. Way better than any Chiltons or Haynes! And did I mention it's free?